I've never seen the movie Driving Miss Daisy so it was perfect timing when the announcement came from Playbill that Vanessa Redgrave and James Earl Jones were starring in the Alfred Uhry play. You see, I have this "check list" of must see theatre dames in my mind. 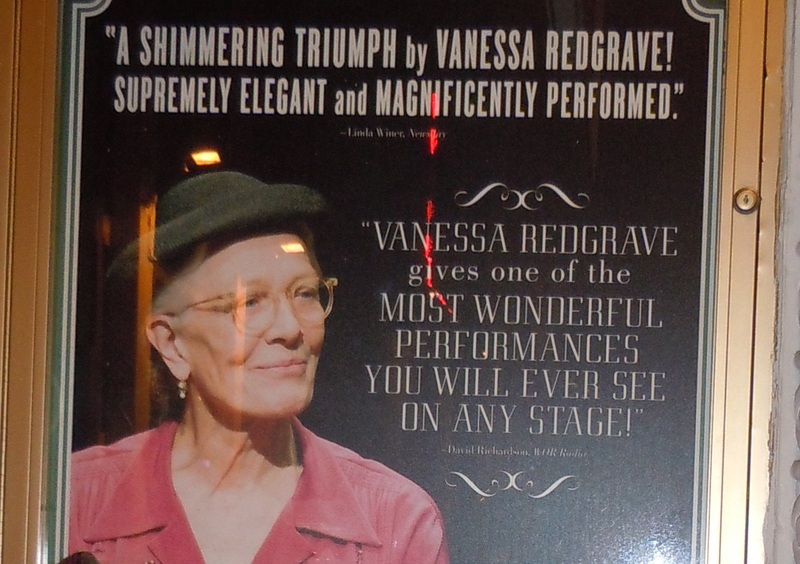 It includes Angela Lansbury, Rosemary Harris, Marian Seldes, Elaine Stritch and Vanessa Redgrave. I knew I had to see this play and luckily after this, I only had one name left to cross out from my list, Marian Seldes. Lani, Tom and I saw Driving Miss Daisy on Nov. 27 (Sat. eve) at the Golden Theatre in NYC. Lani pretty much talked about the play itself in her post (click here) so I'll just discuss the performance. Ms. Redgrave's Daisy Werthan is spunky and very independent. She'll do things her own way and no one can stop her. I really appreciated that take on the character rather than just a dour old lady. She made Daisy very sympathetic and endearing. It's also lovely to see Ms. Redgrave on stage with such elegance and grace. She's captivating. Usually known for more dramatic roles, here she was able to show that she's a very funny lady with good comedic timing. There were a lot of audience chuckles during her banters with Hoke. Hoke, Daisy's chauffeur, is played by James Earl Jones. He always had a very cheerful demeanor whenever Daisy was in her feisty mood. He is the perfect foil to Daisy's saber and very gently was able to melt Daisy's demeanor. Boyd Gaines plays Boolie, Daisy's son was excellent standing up to his very stubborn mother. Mr. Jones and Ms. Redgrave's chemistry is so perceptible that as an audience member you feel like a fly on the wall watching the interaction of two people who share a real friendship. It's a joy to watch them cherish being on stage together and this becomes more apparent at curtain call with how jovial they are during their bows and acknowledgement of each other.